Prominent & Leading Manufacturer from Mehsana, we offer counterflow asphalt plant and mobile counter flow asphalt mixing plant. The reputation, we have acquired in the market is due to our involvement in providing Counter Flow Asphalt Plant. Our offered asphalt plant is stringently tested by our quality controllers as per with industry standards. This asphalt plant aggregate flows towards the burner resulting in more heating time. 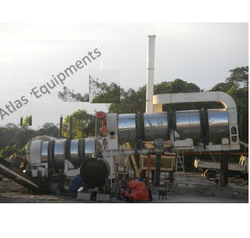 Customers can avail this asphalt plant to our customers in numerous specifications. The control panel is PLC/Microprocessor based. Mobile counter-flow asphalt mixing plant is for those customers who want addition fuel savings and better quality of hot mix asphalt that is promised with the counter-flow asphalt plant but also desire complete mobility. Sometimes you will have critical projects that will require frequent shifting of the plants from one place to another and also want to make high volumes of HMA. 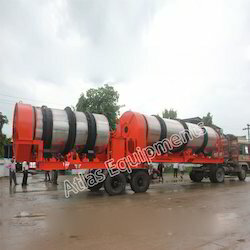 This counterflow asphalt mixer by Atlas is designed for maximum mobility and its compact design is suitable for long-term projects and frequent shifting. It promises erection and dismantling in short time. All the units are modular which makes transportation easy. The highlight of this machine is the separate zones of heating and mixing. The first drum is the heating zone which heats the aggregates in a counterflow process. In the second drum, heated aggregates are mixed with bitumen and filler material. Addition of recycled asphalt is also very easy on this equipment. Reclaimed asphalt pavement (RAP) can be added into the second drum so that it gets effectively mixed with the virgin material. Looking for Counterflow Asphalt Plant ?